The Andes? Yeah, they'll entrance you. Ben Girardi/SASS Global Travel photo. It’s mid-July and summer is getting tiresome for many of you. Sweltering temperatures are in full swing across North America, and if you’re a skier or snowboarder, the novelty of skimpy clothing, sunshine and barbecues has worn off. A handy overnight flight to South America will fix this problem. Let’s be clear: skiing in South America is not just for sponsored skiers or pros with external funding. The flight will cost you, but beyond that, opportunities abound to get after it on the cheap. In fact, the cheaper, dirtier, and looser your trip, the better. A summer in South America on snow, and on the cheap, is in fact its own type of bucket list adventure and one that will give you a million more experiences that your average pow shredding trip ever does. The gringos bring some of home with them to Chile. Hillary Saunders photo. #1: You don’t need to plan the whole trip (and you really shouldn’t) before you go. It’s easy to get around the Andes on the cheap, and you can storm chase after you arrive. 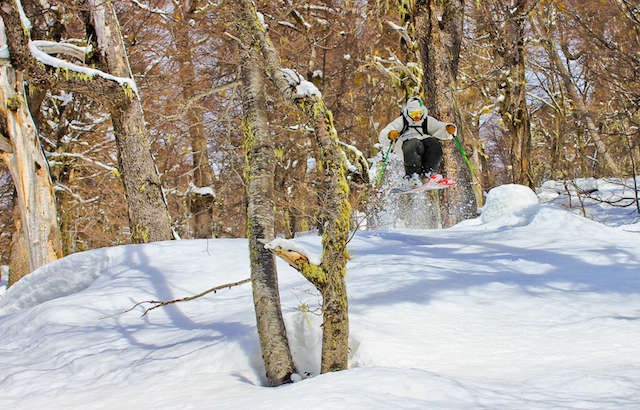 You should first head to one of the better known, super-stellar freeskiing meccas: Las Leñas or Bariloche’s Cerro Catedral in Argentina, or Nevados de Chillan in Chile. For your first foray, not only will you get kickass, mind-blowing skiing but a homebase, new friends, and all kinds of beta on more out of the way (i.e., cheaper) places that you can bus to. 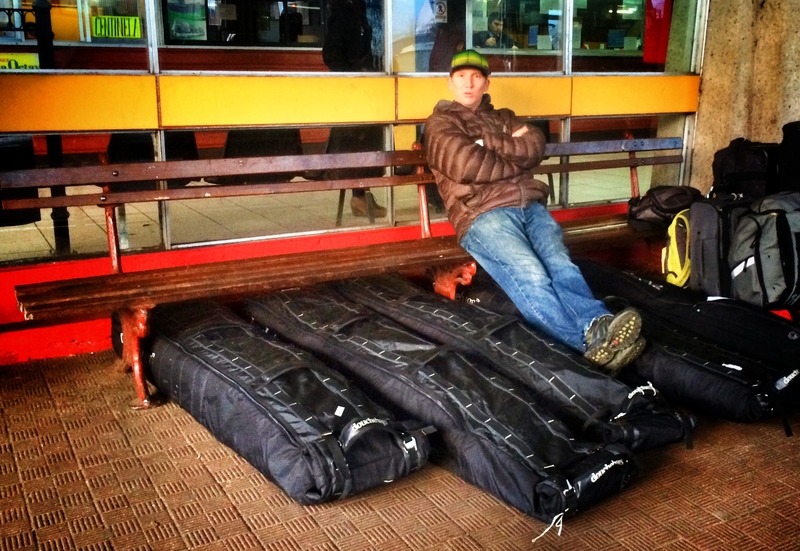 Ski gear for locals, like Alan Quiroga above, is massively expensive in South America, and skids can win big friends by selling their stuff. Ryan Dunfee photo. #2: Don’t forget anything. Seriously. Bring everything you might need, and spares/repair kits where applicable. Ski gear is hard to come by and if you can even find it, it’ll be three times the retail price. 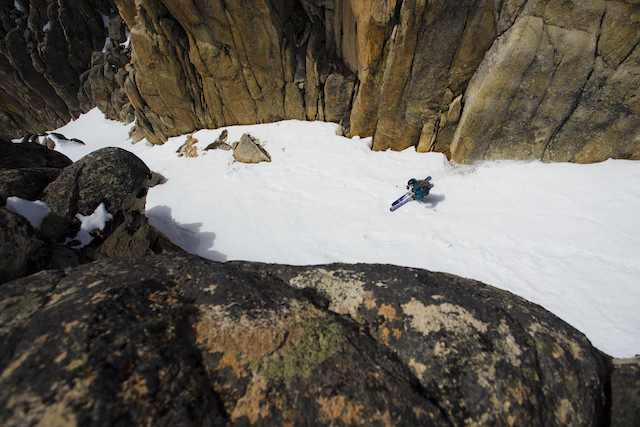 Anything powder or backcountry-specific is next to impossible to find. It’s also totally normal for local South American shredders to offer to buy your gear right off you, because they’re starved for good ski and avalanche equipment. Incidentally, that situation happens to be a good way to make back some money at the end of your trip... we suggest bringing extra gear you're looking to get rid of, as selling a local a pair of old pants for a fair price will win you a new friend and likely an invite to a spare couch or asado barbecue laden with life-changing beef (sorry vegetarians). South America has loads of incredible high-alpine terrain, but it can easily get shut down by endless storms, wind, or warming temps. Move around accordingly. Ben Girardi/SASS Global Travel photo. #3: Where to go. Well, depending on what resort you are aiming at, you’ll first end up in one of the two capital cities of the southern cone: Santiago, Chile, or Buenos Aires, Argentina. You can literally take a bus almost anywhere from the either place. I recommend heading to Las Leñas in Argentina or Nevados de Chillan in Chile. Places like Retiro bus station in Buenos Aires are ground zero for pick pockets and people looking to take advantage of you, so keep hold of your gear and eyes open. Wikimedia photo. #4: When exiting airports, employ city face. Overall, it’s pretty smooth and easy travel, but some sketchy people are happy to “help” trusting, clueless travelers by sneakily taking their stuff and/or money. It’s smart to grip your bags like a maniac at all times and be aware of all the people around you, just in case. Another quick tip: when you step outside with your bags, DO NOT accept taxi rides (or any help) from anyone who comes up to you. You will pretty much be guaranteed to get ripped off. Keep in mind it’s not an all-inclusive resort, but a massive, seething, foreign metropolis. As easy as it is to stumble into a mishap, it’s even easier to stay out of them by paying attention (and, frankly, not acting like a country rube). There are some very stark economic inequalities in South America, and the simple fact that you ski puts you at the top of the pile. All these helpful people just think you have loads of money that you want to share. This sentiment applies to varying degrees throughout your trip. 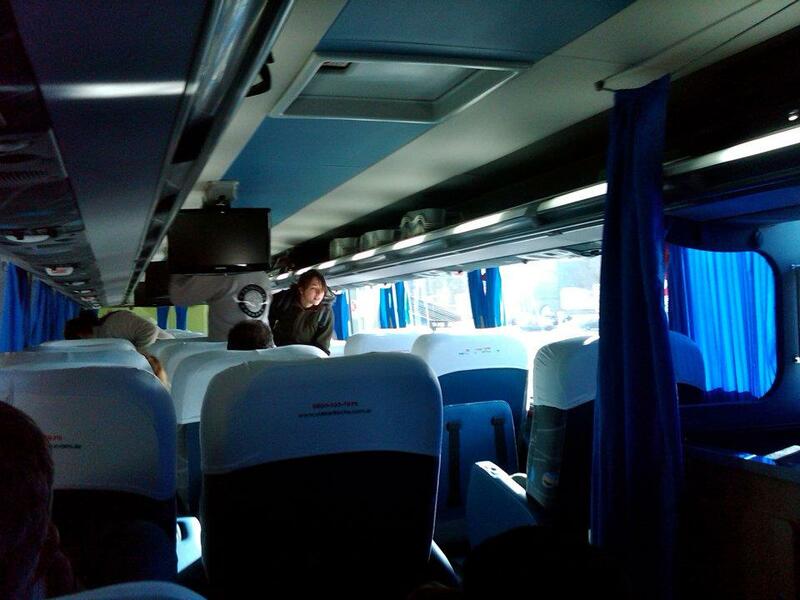 Bus travel is a way of life in South America, and is often cheap and comfortable (unlike in the U.S.). Jon Slaughter photo. 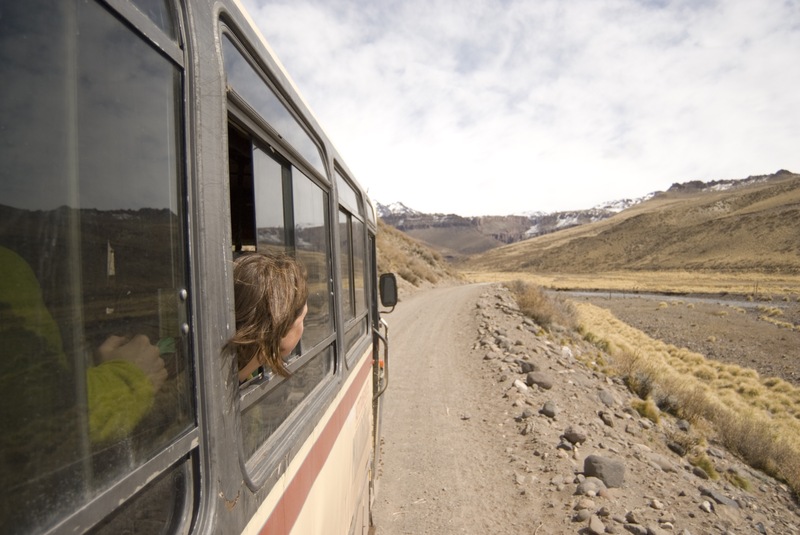 #5: Fear Not The Almighty Omnibus: South America has an incredible network of busses that go everywhere, often, and have accommodations as comfortable as a first-class airplane ticket. They are cheap and mostly reliable. 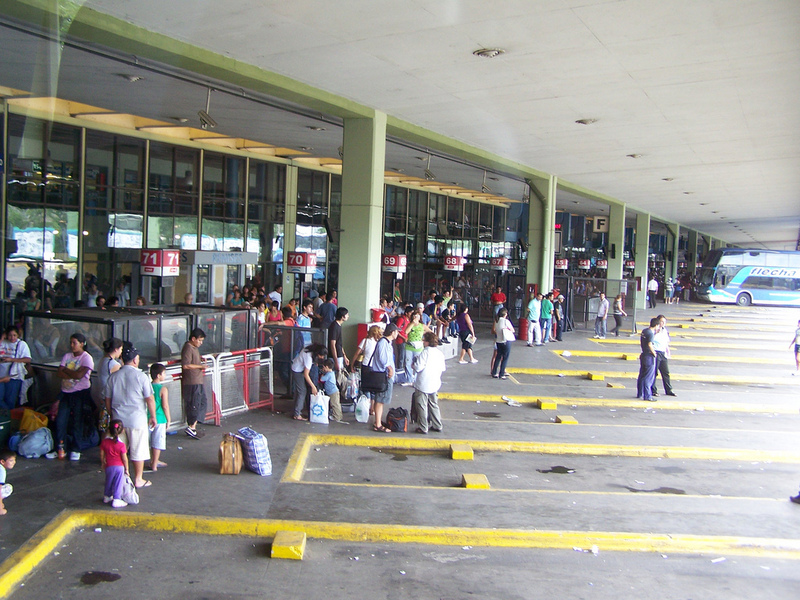 Travel from the airport to the (omni)bus station can seem daunting, but it’s also easy. It’s better with at least a faint grasp of Spanish, but not impossible if you don’t speak the language. #6: In Santiago, ask the tourism people at the airport what the going taxi rate is (usually around $15 USD) to the Terminal de Bus, for example, which is one of several stations, but a good go-to for busses to the south or over to Argentina. Shove all your gear in the tiny cab (it’ll fit!) and simply don’t pay more than what the tourist kiosk gave as the going rate. Tips are 10% maximum for just about everything. 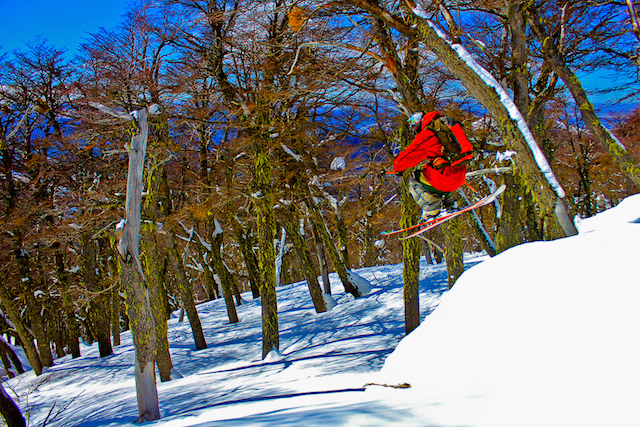 Bariloche local Andres Labbozzetta airs into the trees at Cerro Catedral. Ryan Dunfee photo. #7: In Buenos Aires, from Ezeiza airport, employ the same defensive deal by looking like an unfriendly target, and find the pick-up spot for Tienda Manual Leon, which runs a super cheap airport bus (about $10 USD, ish) that will take you to one block from the Terminal de Omnibus de Retiro, which will take you to skiing. And yes, you need to remember that whole, precise, name. Your giant ski bags scream "I have money!!" but thankfully most bus stations have legit luggage storage. Pete Connolly/SASS Global Travel photo. #8: Ditch your bags! You’ll likely arrive in the mid-morning to the bus terminal, and your bus to wherever you are going will likely be an overnighter leaving 12-14 hours later. Pay a nominal fee to leave your bags in the guarderias, which are secure luggage depots where you can lock up your bags for the day. Guard-Pack is found in the basement of Retiro, and there’s a guarderia de equipajes at nearly every other urban bus station as well. In all your weeks of skidding, the cama section of an overnight bus will be the most cush accommodations you'll enjoy. Ryan Dunfee photo. #9: You’re almost home free! 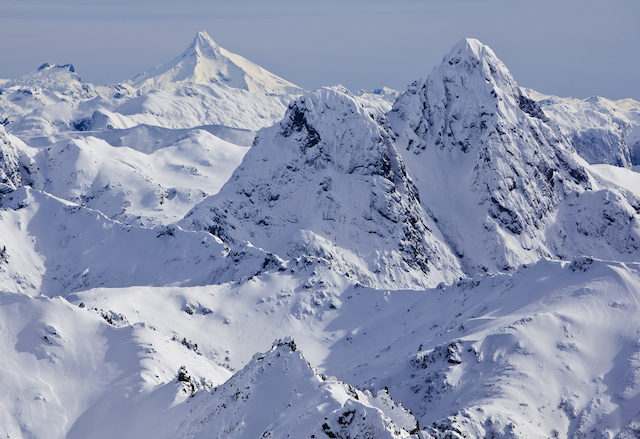 Go to the ticket counters and search the cheapest ticket to your ski place you can find. If your trip is over five hours, which it will be, get a cama or semi-cama ticket. And now you can wander, 100-pound gear bag free, around the city for a day of urban fun! In Santiago, head to Bella Vista or Providencia neighborhoods, in Buenos Aires, San Telmo, Soho, Palermo or Recoleta are among a few good bets. Also, dehydrate yourself starting in late afternoon, before your ride leaves. Even the ‘nice bus’ bathrooms are pretty revolting. Tip the bag loaders on the bus about $0.50 to $1 USD, in the respective currency. Lift tickets don't come cheap down here, despite the relative lack of safety. But the terrain! Brigid Mander photo. #10: Lift tickets are not actually that cheap, considering the lifts look like deathtraps (and they are, yet you’ll ride them anyway because the terrain is awesome!). But, luckily, you can skimp on lodging. 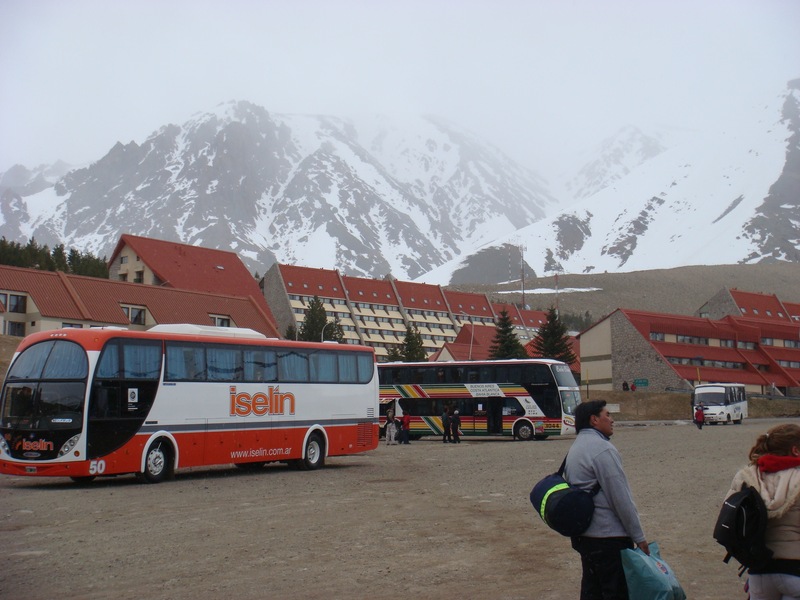 The overnight buses showing up to Las Leñas on a low snow year. Brigid Mander photo. #11: At Las Leñas, space is limited. Leñas is basically a small collection of hotels in the middle of the Andes underneath some of the most epic lift-serviced skiing and riding on Planet Earth (if the Marte chair is running–be sure it is!). If you have a crew, you should try to find a place in advance. But if you’re one or two people, you can try just showing up. Chile, delivering. Photo courtesy of Hillary Saunders. Las Leñas has a few cheap options, like the infamous "gringo ghetto," where the majority of ski bums live. They’ll usually cram you in (for a fee of course) somewhere. It’s also the best concentration of ripping skiers and riders, so a good spot to make friends. Los Molles, about 19 kilometers down the road, has a decent, cheap hostel but you face a difficult transport dilemma every day. Hitching is hard, and there is no bus. 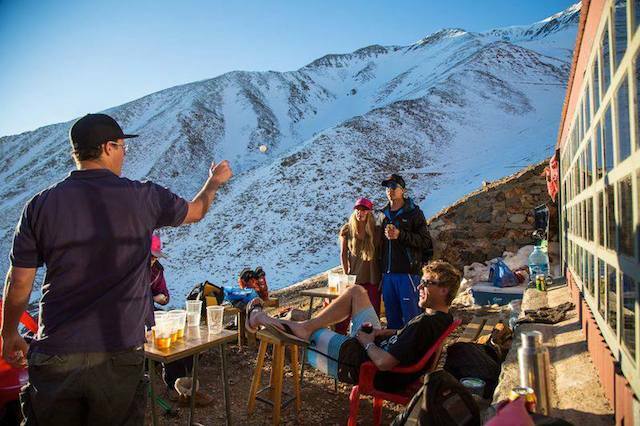 The ski town for Nevados de Chillan is little Las Trancas, which has a few hostels, as well as one of the best ski bars on the planet: Snow Pub, a ridiculously fun, muy peligroso place. In fact, don’t go there unless you know skiing is going to be shut down the next day. Andrew Burns has been skidding in Argentina for 10 years, and finds the travel more than bearable for some mid-summer booter sessions. Ben Girardi/SASS Global Travel photo. 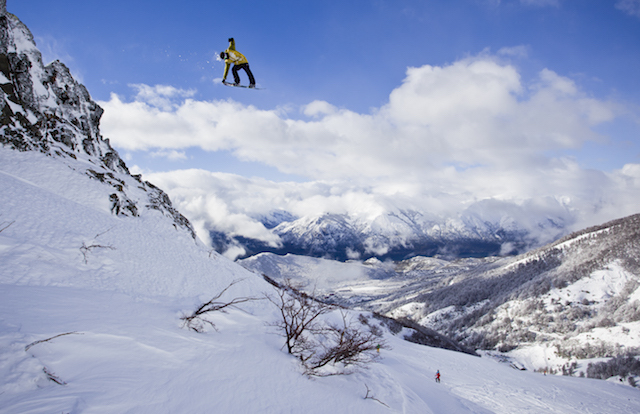 Cerro Catedral has options to stay at its base area, and SASS Global Travel runs their backcountry freeride program from the base area as well, or you can stay somewhere hostel—ish in the nearby city of Bariloche, which runs cheap local buses to the ski hill all day. Hitching is also a way of life in Bariloche, and you'll see it done in abundance to get to and from the hill. 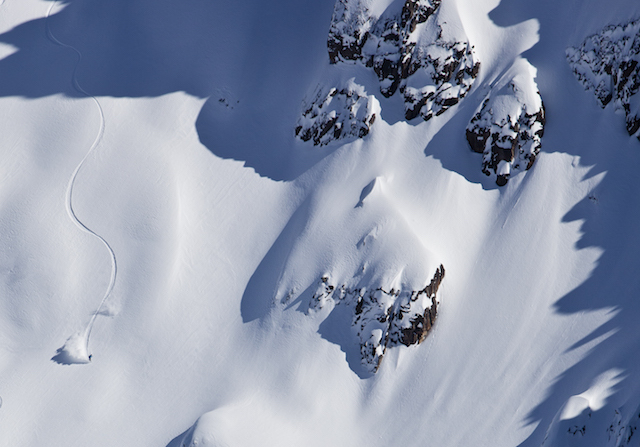 The terrain you'll ride, good snow or bad, is unlike anything else you'll have stepped up to. Ben Girardi/SASS Global Travel photo. #12: After you get your bearings, some bussing experience, and some big lines, you can branch out…there are numerous incredible, small, out-of-the-way adventurous options with rad skiing. But, that’s another story. #13: Be aware of the "A-factor." Especially in Argentina, time and logic operate under an entirely different logic. Things that are scheduled at a specific time may not start for hours afterwards, lifts may not run for no explainable reason, and any interaction with a government official is likely to be arduous, confusing, and extremely time-consuming. Be ready for it, go with the flow, and enjoy life at the slower pace. 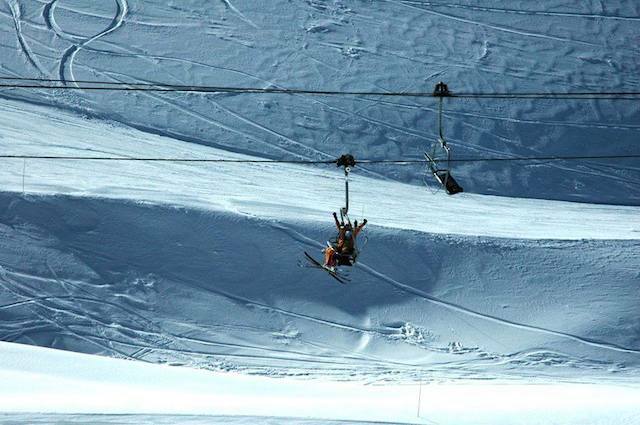 PS: Lastly, if you are still really feeling daunted, you contact southamericaski.com, a Canadian-based ski trip organizer. On the side, these ski bums at heart will help out the skids with bus tickets and cheap lodging without trying to entrap you in a pricey, useless itinerary. 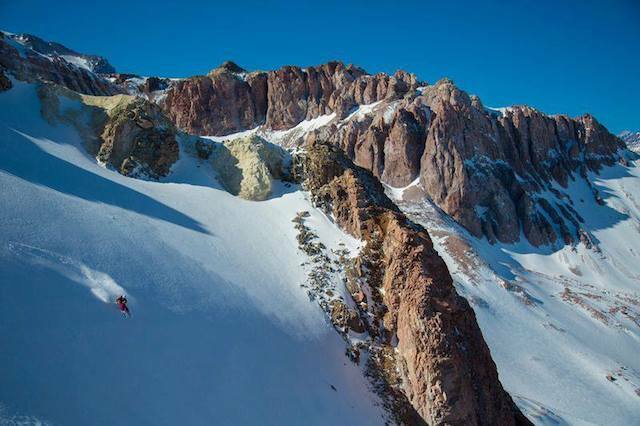 If you're looking for a bit more of an organized trip, especially if you're not a self-sufficient backcountry skier or rider, we recommend checking out SASS Global Travel, who run an full-service big-mountain and backcountry program from the base of Cerro Catedral in Bariloche. They also penned up a great guide about traveling to Argentina specifically to ski or ride, which you should also check out. From a guy interning down in Puerto Varas, Chile and snowboarding every weekend possible, I would say this is a spot on article. You can get almost ANYWHERE by bus, and bring all gear possible. The powder here is amazing and the back country options are endless. Plenty of natural terrain for freestyle practice as well. Solid article. As an Argentinian i can say that i agree 100% with this guide!